It's only few days before Valentine's day and I have here one lovely waterproof purse in pretty red color just in time for the occasion. I've found it at etsy.com from the See-Too By Bell design. Got some description from the maker and learned that it's a handmade cotton fabric purse cover with transparent PVC sheet for water resistant. A lovely retro inspired cosmetic purse in funky dial design to keep all your make-up must haves or keep your cellphone, stationary, notebook, calculator, pen and etc. 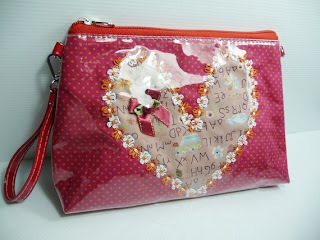 This pretty purse is waterproof with a zipped opening and fully lined. It's sturdy and highly durable with 2 compartments. It has two handles for short and long.